Information or pictures are always welcome! This is a very long page! Stripped to bare aluminium and perfectly repainted by Alfred Genther, BAMF (Swiss Logistics Command) paint specialist, at Dübendorf. 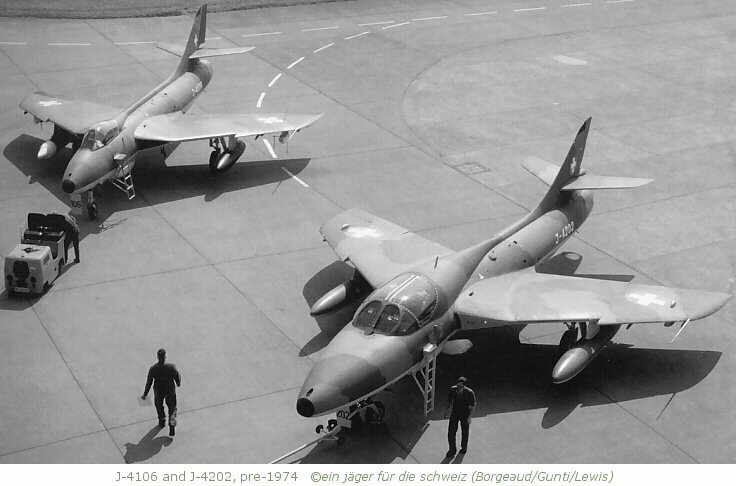 Aircraft returned to its original early 1960s condition, without braking parachute or KAWEST (Kampfwertsteigerung = Increased Operational Performance) modifications. 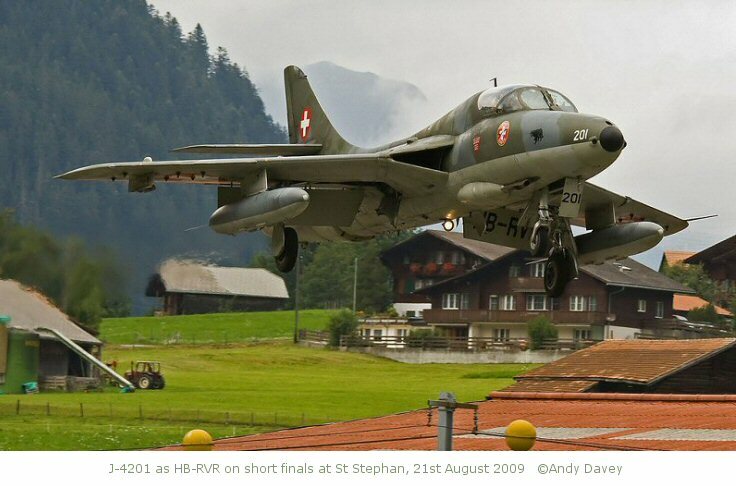 Dead-stick landing at Alpnach after engine failure, following exercise at Alpnachersee. Aircraft repaired after taking safety net, and undercarriage collapse. 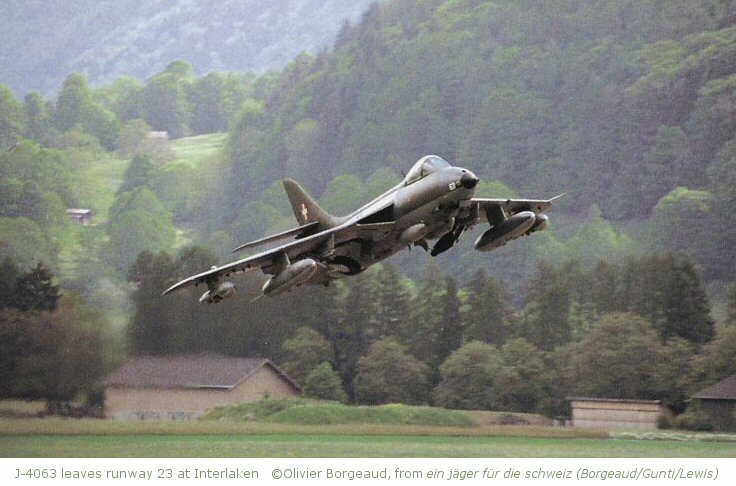 Preserved by Musée de l'Aviation Militaire de Payerne "Clin d'ailes"
Compressor blade failure en route Interlaken - Emmen, during pre-delivery test flight. Pilot attempted unsuccessfully to glide to airstrip at Thun, aircraft crashed into orchard at Schwendibach, region Steffisburg, Kanton Bern. Pilot Hptm Weber (KTA) ejected safely. HAL replaced engine, but not airframe. Aircraft taken out of service. Zivilschutz (Civil Defence) at Wangen an der Aare, Bern (fuselage only). 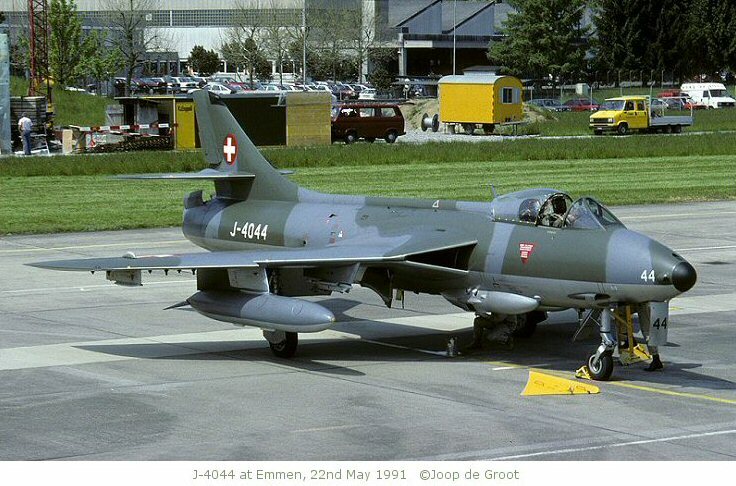 Emmen AFB: Destroyed by fire during static engine ground run. Owner: Werner von Arx, Riehen, Switzerland. 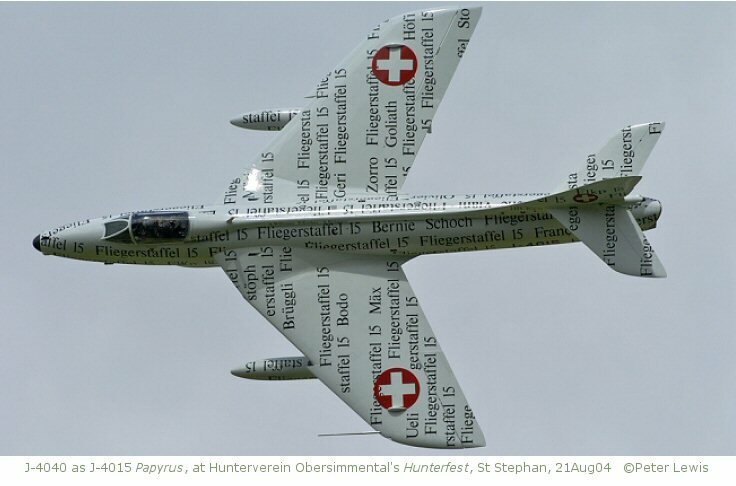 crashed at Littau, Kanton Luzern. Aircraft destroyed. J-4035 is now on display at Pima Air & Space Museum, Tucson, Arizona (on loan from Planes of Fame, Chino). She has been repainted, and greatly improved from her display condition at Grand Canyon National Park. Crashed at Riddes, Kanton Valais. Aircraft destroyed. Pilot (Fl St 4) ejected, minor injuries. Crashed near Aumont, Kanton Freiburg. Aircraft destroyed. Crashed between Grandcour and Chevroux (Kanton Vaud). 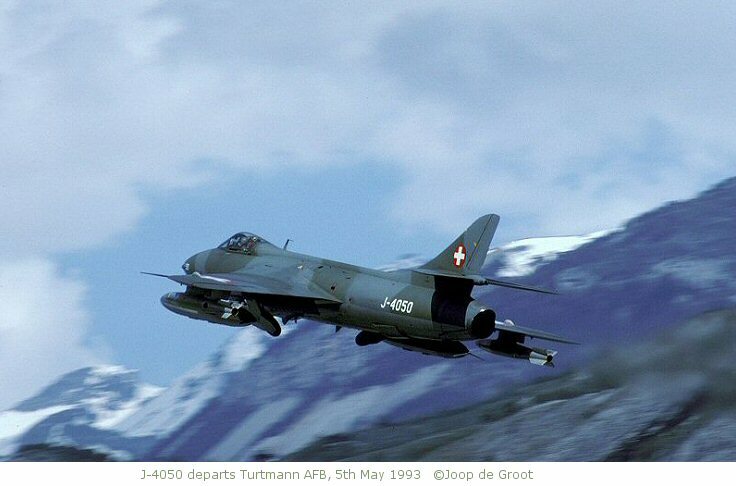 Crossed line of fire of J-4124 (flown by Wm Christoph Lutz) during firing at the Forel range near Neuenburgersee (Lac de Neuchâtel). Aileron linkage damaged, causing uncontrollable spin. Pilot (Fl St 1) ejected injured into Neuenburgersee. 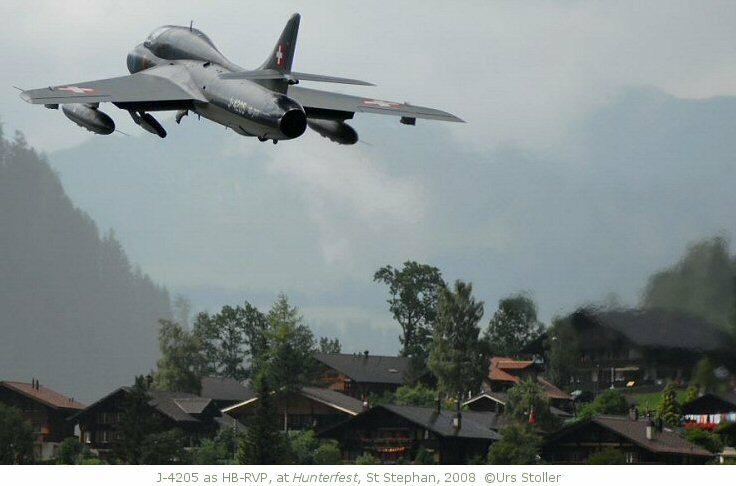 Mid-air collision with J-4016 during combat training out of Dübendorf AFB: Crashed at the Tutensee Nature Reserve, Menznau, Kanton Luzern. Aircraft sank into marshy ground to depth of 12-14m, and was not recovered. 2006 Planned move to UeG-Museum, Dübendorf? 2006 Owned & maintained by HHA, operated under COMA (Civil Owned Military Aircraft) regulations with serial ZZ191 (from 08Nov06) on defence simulation tasks, and flown by FR Aviation pilots. HHA can operate for the Ministry of Defence on the UK military register under the AvP67 guidelines. 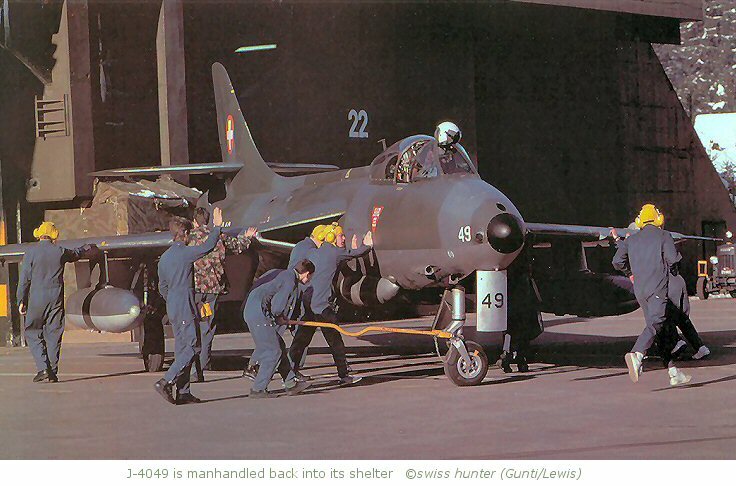 NOTE: This is the second Hunter with serial N339AX. shortly after take-off from Hillsboro, Oregon. 2006 Owned & maintained by HHA, operated under COMA (Civil Owned Military Aircraft) regulations with serial ZZ190 (from 02Jan07) on defence simulation tasks, and flown by FR Aviation pilots. HHA can operate for the Ministry of Defence on the UK military register under the AvP67 guidelines. 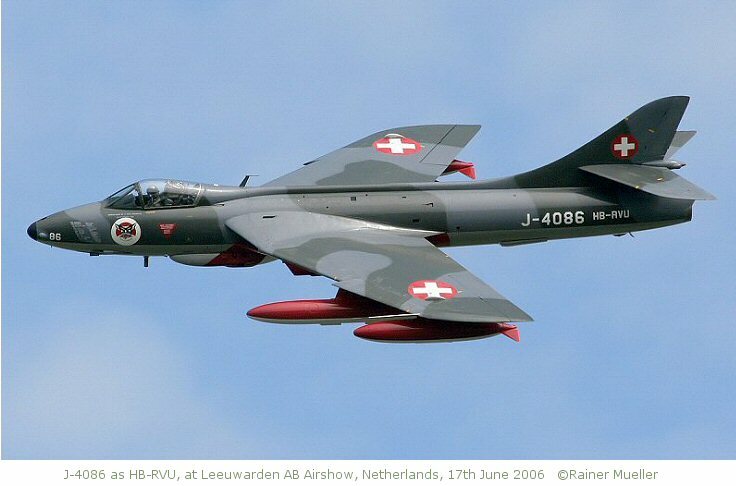 Lost a wing in mid-air collision with Venom FB4 J-1751 during exercise out of Meiringen AFB: Crashed at Hasli, Wimmis (near Spiez), Kanton Bern. Pilot (Fl St 5) ejected with difficulty, minor injuries. 09Apr62: Light collision with crane while on approach to Dübendorf. Aircraft landed safely. Shown on static display at various functions at Beauvechain, between 2007 and 2010. The aircraft is firmly grounded, but rumoured to be flyable. 11Oct61: Hit by gunfire from another Hunter during training. Aircraft landed safely at Emmen. On display at Musée de l'Aviation Militaire de Payerne "Clin d'ailes"
2006 ACTIVE AIRCRAFT Northern Lights Combat Air Support. Jet Heritage/RV Aviation Ltd. Hurn UK, for Royal Jordanian AF Historic Flight, refurbishment not completed. 2006 Based at Eskilstuna, Sweden. 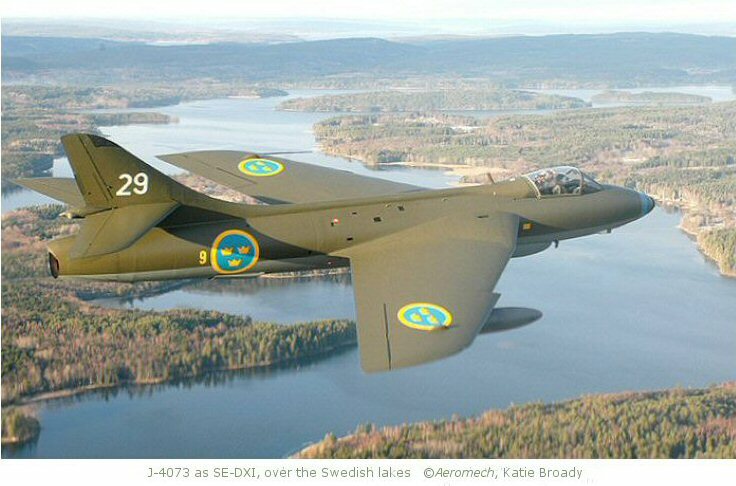 Aircraft maintained & operated in Sweden by Västgota Veteranflygförening (VVF). March 2013 Now removed (with the Mirage) from display at Cointrin, due to lack of space. Future unknown, but apparently to be preserved. 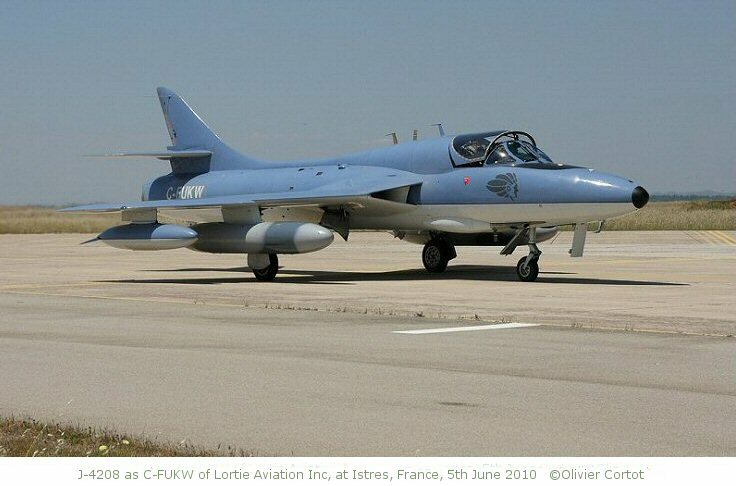 May-June 2013 Aircraft to be dismantled, crated and transported to Canada. as C-FKGO. Registration cancelled 22Apr15. 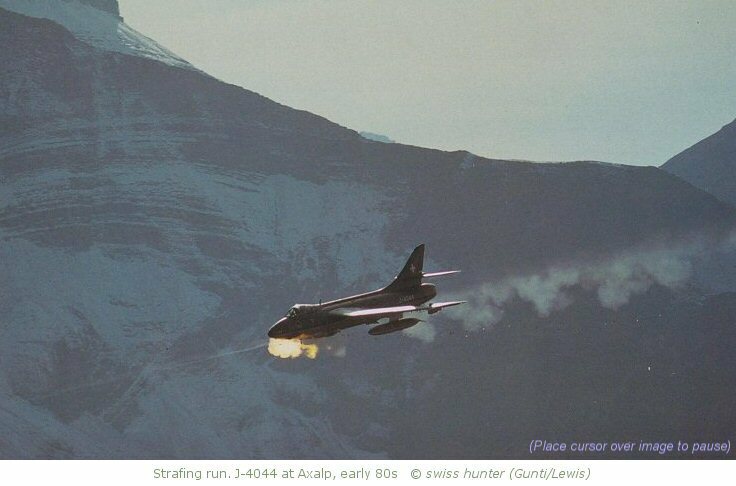 Mid-air collision with J-4113 during ground attack at Bonaduz, Rhäzüns, Kanton Graubünden. 06May10 Gear-up landing at Point Mugu, California. No injuries. September 2010: Sold to Hunter Aviation International, Delaware, USA, for ATAC USA operations. Crated and shipped to Canada for restoration back to flying condition. Training flight from Meiringen: Crashed after collision with trees in bad weather at Mutschellen, Berikon, Kanton Aargau. After the building of the Berlin Wall, and the Cuban Missile Crisis, all frontline aircraft were kept in combat readiness and armed. 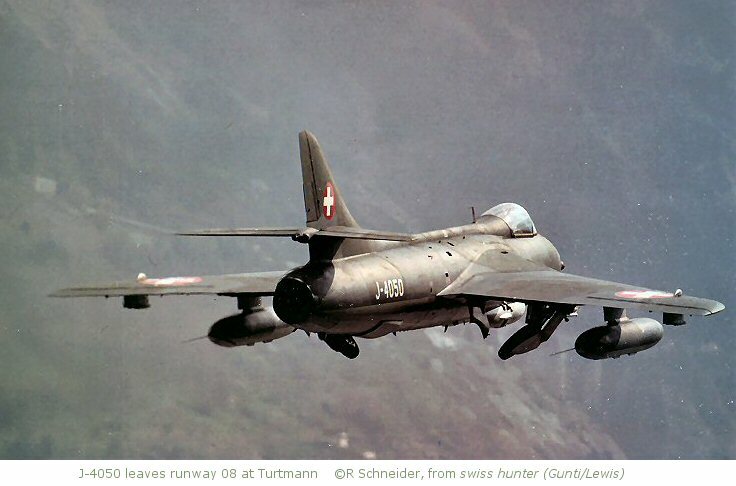 In September 1968 the fuselage of XG127 was severely damaged in No2 Squadron's hanger 7 at Gütersloh after accidental cannon firing by another FRMk10. 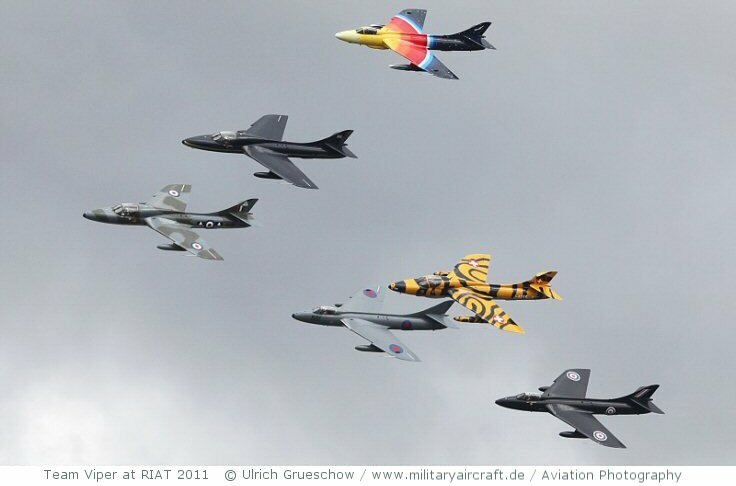 This incident led to radical changes in the handling of armed aircraft at Gütersloh. while taking part in the Sentry Aloha military exercise. 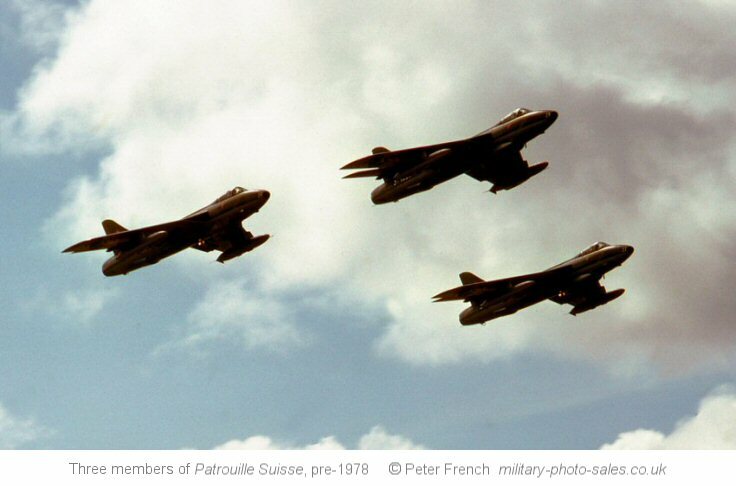 02Dec68 overshoot at Lyneham UK, aircraft damaged. 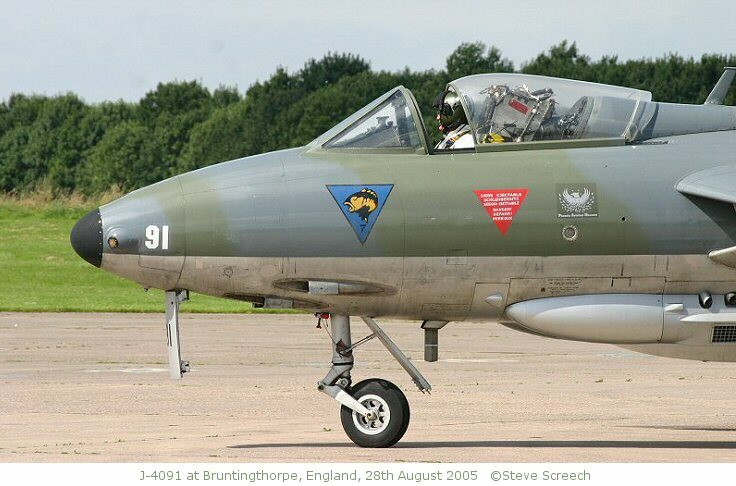 April 2004 After Dan Lavigna's death in March 2003, this aircraft was looked after by Bob Guilford. In April 2004: Airframe hours 1830, engine 330. Aircraft was for sale, complete with spares & support. 19Aug11 Runway excursion after crosswind landing. 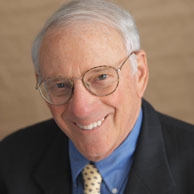 Drag chute used. 05Nov12 Gear-up landing at Point Mugu, California. No injuries. ATAC pilot Thomas 'TC' Bennett died today when J-4105/N329AX crashed on approach to Point Mugu Naval Air Station, California. Delivered 23Sep55 to 222(F)Squadron ('A'), No229 OCU. Delivered 10Oct55 to 20(F)Squadron ('D'), No229 OCU. 2013 Aircraft owned by HHA, stored at Sola, Norway. 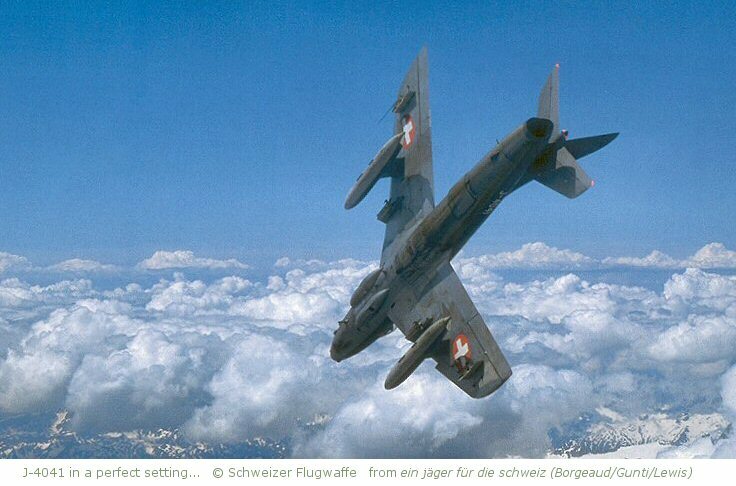 Training flight from Dübendorf: Mid-air collision with J-4088 during ground attack at Bonaduz, Rhäzüns, Kanton Graubünden. 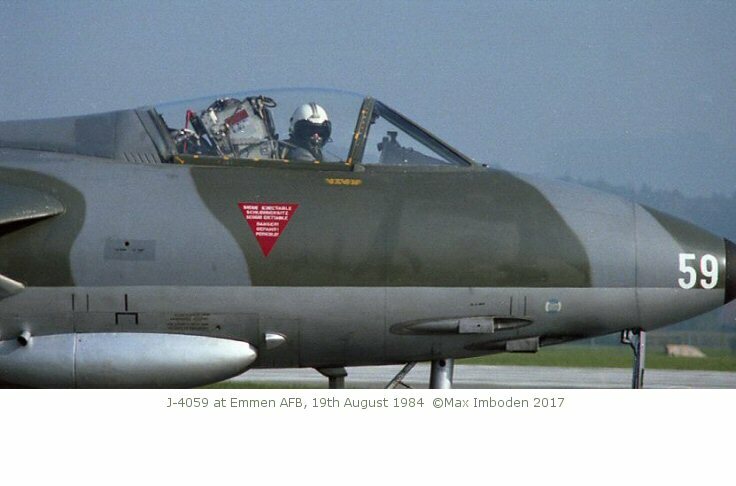 Training flight from Mollis AFB: Crashed near Dagmersellen, Kanton Luzern, after uncontrolled attitude in IMC. Flight from Dübendorf: Crashed at Lenzerheide, Kanton Graubünden. 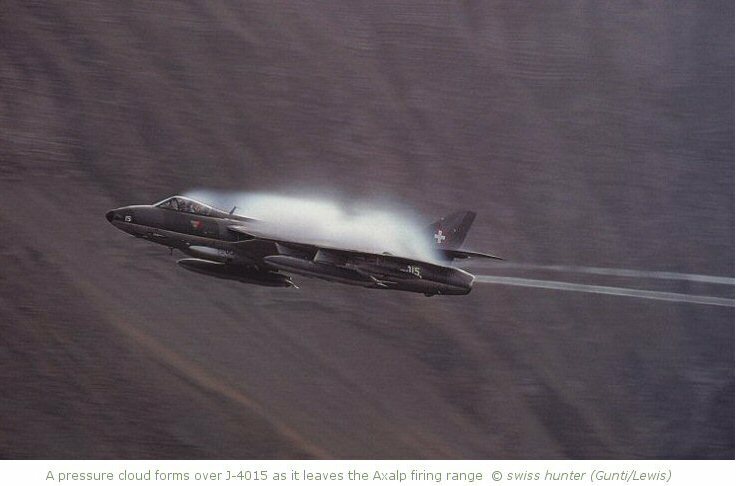 Aircraft out of control at 300m altitude, after passing through jet exhaust of leader. Training flight from Raron AFB: Crashed into Neuenburgersee, Kanton Neuenburg (wing contact with water surface while banking to starboard). Aircraft not recovered. Purchased by Hawker Aircraft Limited July72, serial G-9-406. Purchased by Hawker Siddeley Aircraft May72, serial G-9-389. Purchased by Hawker Aircraft Limited Jan73, serial G-9-411. Musée de l'Aviation Militaire de Payerne, Canton Vaud. Last flight, from Payerne, pilot Claude Nicollier. Purchased by Hawker Siddeley Aircraft 1970, serial G-9-412. Purchased by Hawker Siddeley Aircraft 1970, serial G-9-413. 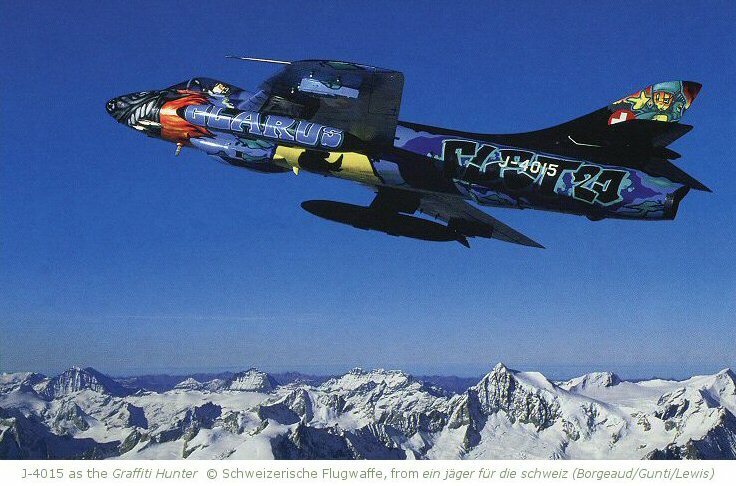 Autumn 2001 acquired by Hunter Flying Group, Altenrhein. Purchased by Hawker Siddeley Aircraft 1970, serial G-9-415.